Chinese New Year begins on Tuesday, February 5, 2019. It’s a special time to honor ancestors and renew family bonds with traditional rituals and feasts. Also known as Spring Festival, for those who celebrate it, it’s one of the most important social and economic holidays of the year. Chinese New Year is tied to the Chinese lunar calendar. The celebration begins on the night of a new moon, and culminates with the Lantern Festival, when families gather in the streets with beautiful lighted lanterns. Part of preparations for the new year is a thorough cleaning of the home, to invite good fortune in the new year. Each day of Chinese New Year is celebrated with friends and family, enjoying feasts, music, gifts, and red envelopes full of good luck money. This year will be the Year of the Pig! In Chinese culture, pigs are the symbol of wealth and good fortune. According to legend, people born in the year of the pig are realistic, thrifty, and are sure to get enjoyment from their lives. They are never lazy, and bring enthusiasm to all their endeavors. The colors yellow, gray and brown, and the numbers 2, 5 and 8 are considered lucky for those born in the Year of the Pig. 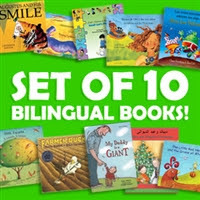 Celebrate this special holiday with the bilingual children’s book Li’s Chinese New Year. Available in English and your choice of 12 languages, the story introduces us to Li, who must make the important decision of which animal costume he will wear to the school’s big New Year assembly. Readers will find all twelve of the zodiac animals in the story, and discover facts and activities relating to the holiday at the back of the book. Now through February 28, 2019 get 10% off Li’s Chinese New Year by entering discount code CNY2019 at checkout! Share this fun multicultural holiday with your students by downloading our free Chinese New Year lesson plan so students can explore the holiday by utilizing geography, crafts and discussion. Compare similarities and differences between the Chinese New Year and the American New Year with a Venn diagram activity. The lesson also includes suggestions for teaching about world geography and population density. The book Li’s Chinese New Year is the inspiration for this lesson plan. It introduces students to the Chinese New Year celebrations and ties concepts together in the lesson plan. Teachers can also use the story to introduce students to Chinese characters in the bilingual English-Chinese version of the book while reading the story out loud in English. The primary focus of the lesson plan is to help children cultivate an appreciation for cultural and linguistic diversity. Through collaborative activities and discussions, students can build positive relationships with one another while learning to appreciate our world’s global diversity. Do you celebrate Chinese New Year? Comment below and let us know what your favorite part of the holiday is! This post is linked with the monthly Creative Kids Culture Blog Hop. Be sure to check out other bloggers’ tips, teaching strategies, and resources! Spring is a great time to celebrate the outstanding educators and language learners in your life! Teacher Appreciation Week & More!